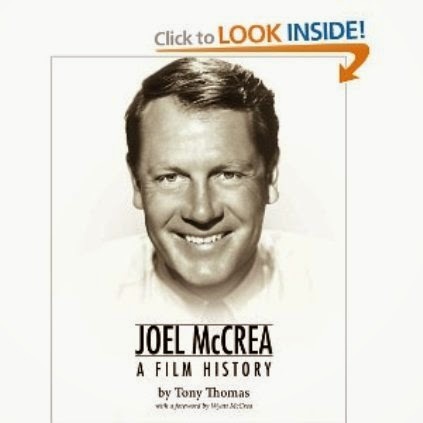 Publishers prefer to feature a photograph on the cover of a film book. It isn't an unreasonable idea. After all, film history is mostly about images. Dramatic tableaus and photogenic faces leave a strong impression on film fans. An actor's friendly smile can be an attractive welcome to prospective readers. 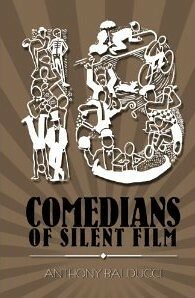 But I wanted something different for my book Eighteen Comedians of Silent Film. I wanted to have an illustration on the cover. 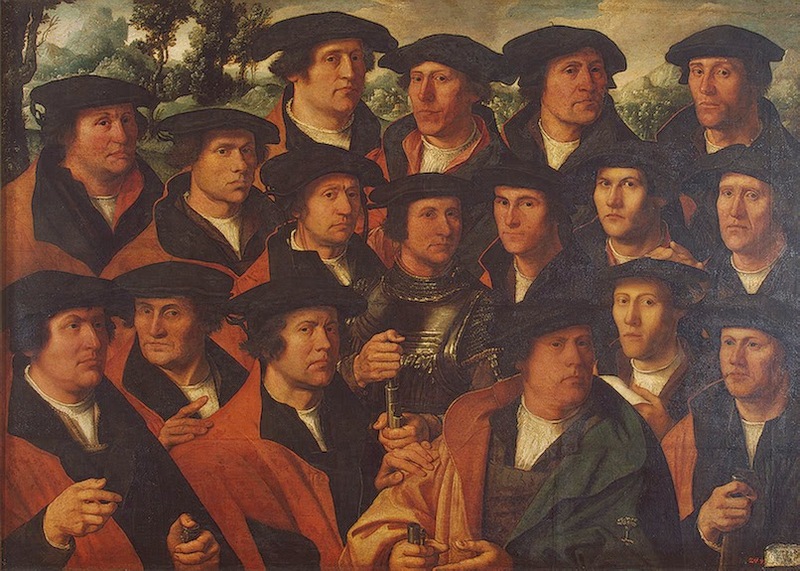 At first, I had something like this group portrait in mind. This is the work of the incomparable Drew Friedman. 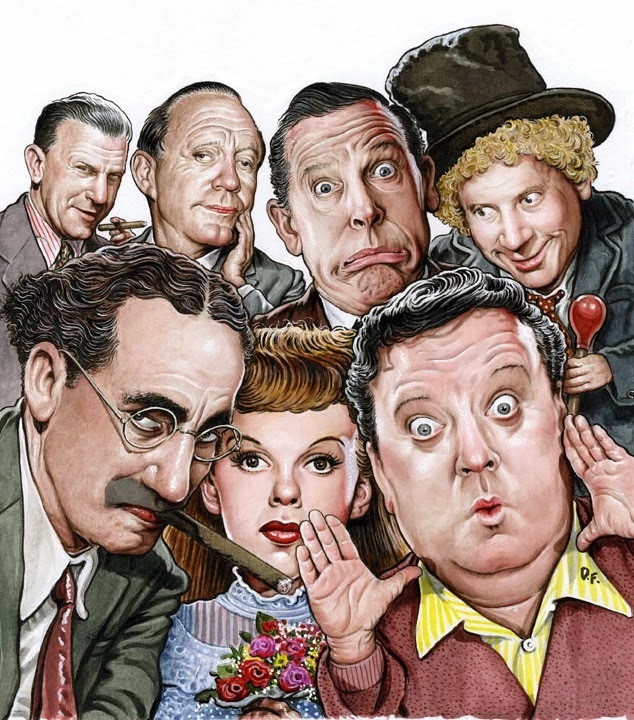 But this illustration features seven comedians. 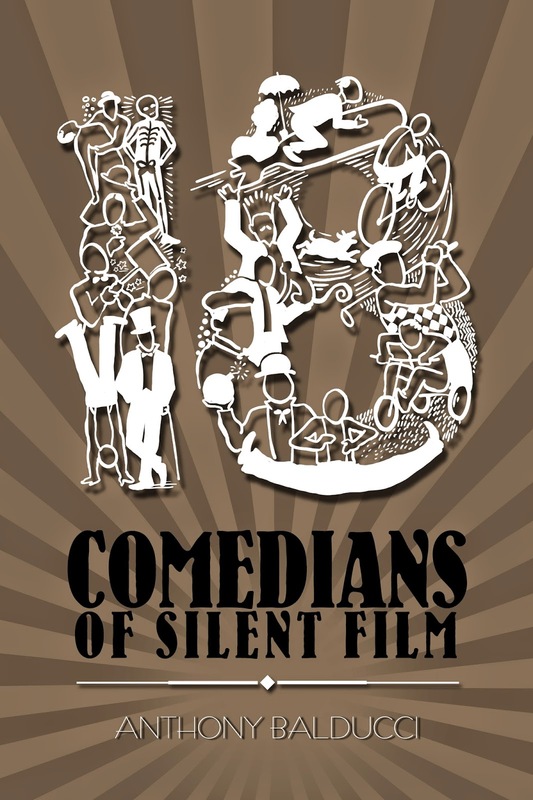 My book, as the title indicates, celebrated a diverse group of eighteen comedians. It would be a tall order to squeeze another eleven comedians into the limited frame of a book cover. 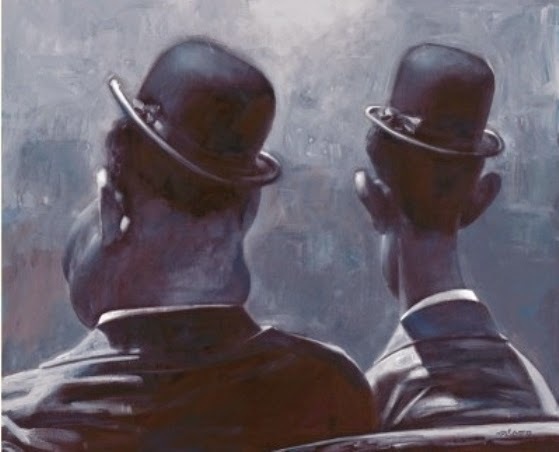 A book cover offers much less space than a wall mural or a magazine centerfold, both of which have been known to support large group portraits. 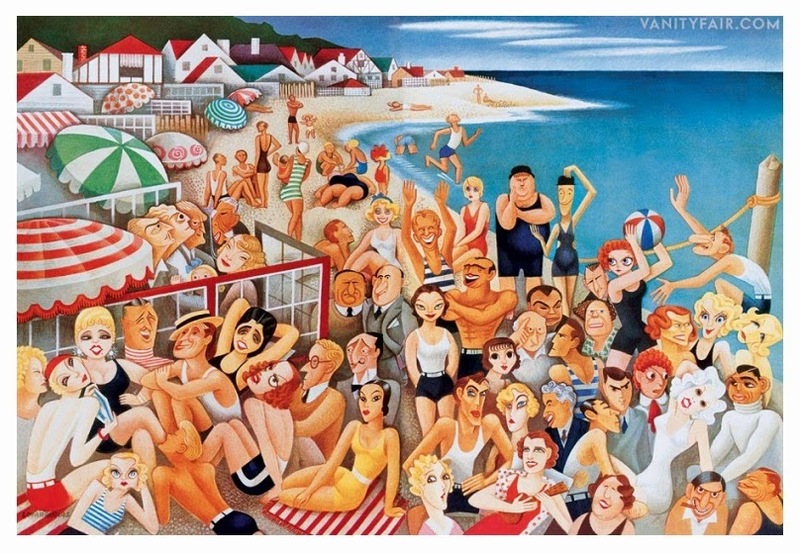 A pioneer of the Hollywood caricature was Miguel Covarrubias, who made this famous group portrait for a Vanity Fair spread. John Decker created this mural for the Wilshire Bowl Restaurant in 1941. How about a mob of Jerry Lewis? 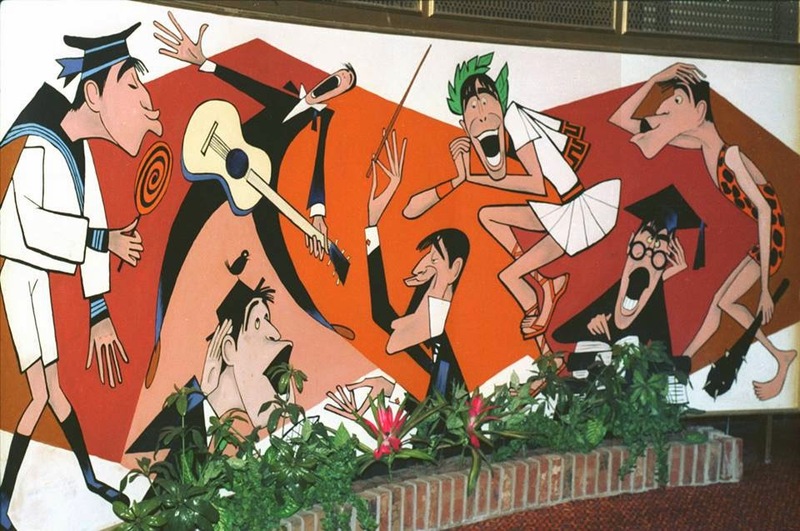 Sam Norkin painted this mural for Brown's Hotel & Country Club in Loch Sheldrake, New York. 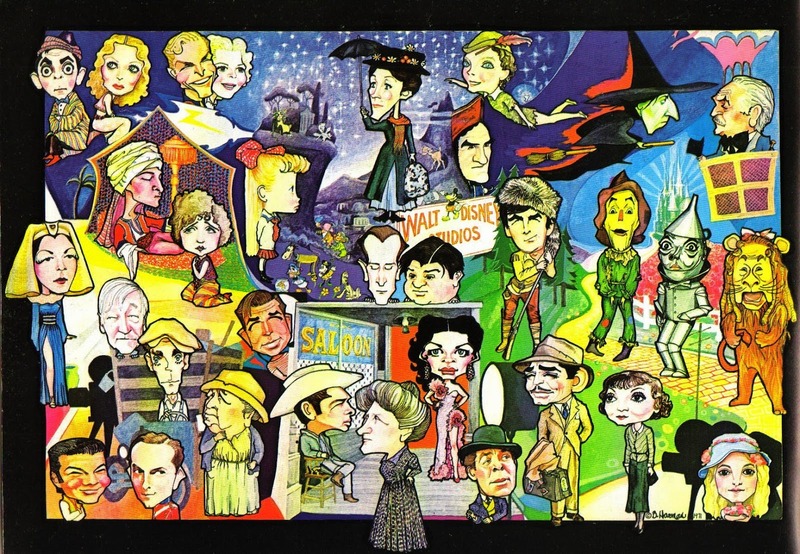 Bob Harman's Hollywood Panorama, which was five-feet wide and nine-feet tall, featured more than a thousand caricatures of classic film stars. That's more than a thousand character designs! Harman created this ambitious work in a span of ten years. This is just one of many panels from the panorama. Sorry, I needed something far less ambitious than this. 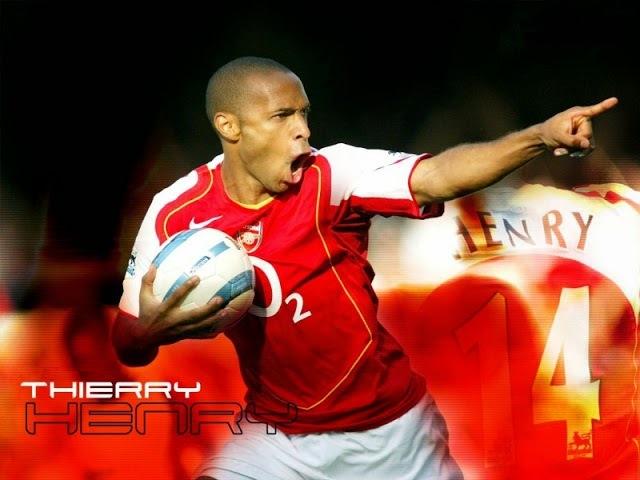 A man's reach does sometimes exceed his grasp. Besides, it was ludicrous to dream of a Drew Friedman cover on a stick figure budget. But, then, maybe stick figure representations of the comedians was not a bad idea. I worked with an illustrator named Henly Sukandra to develop this cover. 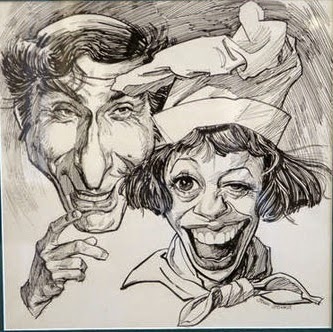 I have always enjoyed caricatures of celebrities. 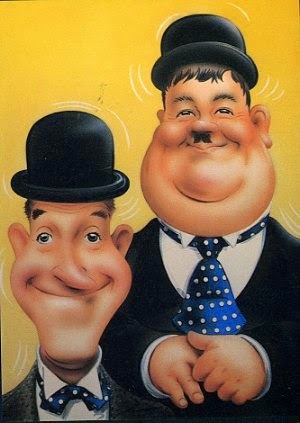 During my childhood, celebrity caricatures were everywhere. They could be found in comic books. 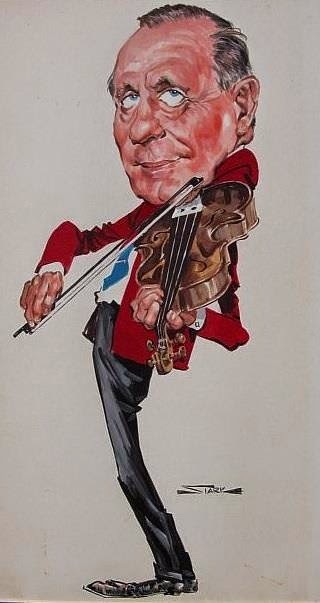 Mad magazine delighted readers with caricatures from the amazingly talented Jack Davis and Mort Drucker. Davis would have had no problem crowding eighteen comedians onto a book cover. 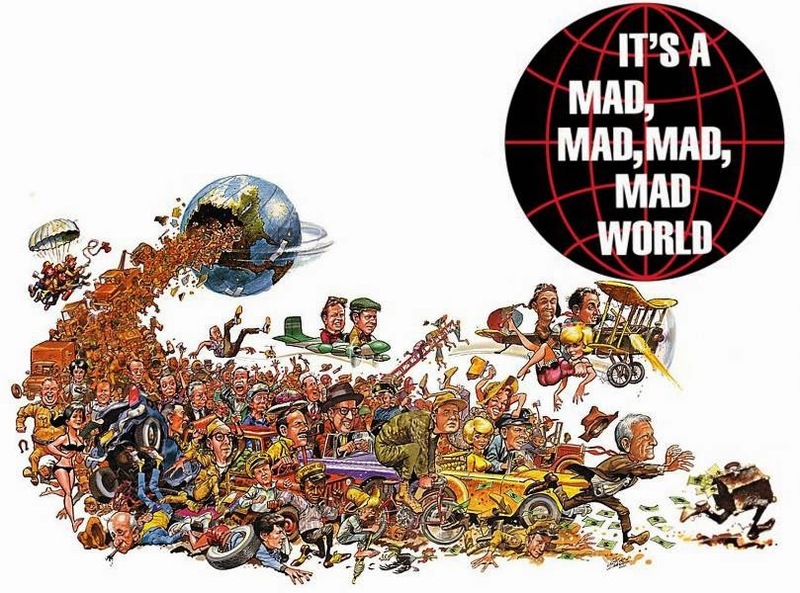 No better proof can be provided than the poster art that Davis provided for It's a Mad, Mad, Mad, Mad World, which is the illustrator's single most popular work. 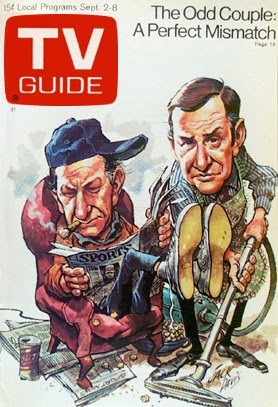 His covers for TV Guide never failed to boost the magazine's circulation. I, myself, made a point to save every TV Guide issue adorned with a Davis cover. Illustrations do more than excite interest in a film or book. Illustrations excite the imagination. Seeing a Davis poster outside of a theater could draw me into the fantasy of a film before I had even seen the first frame. 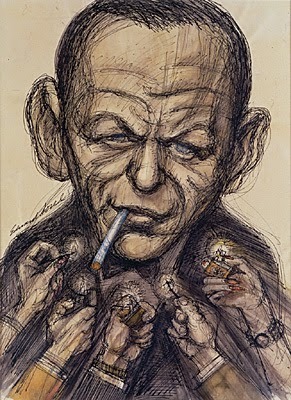 Here is a celebrity gathering created by Drucker. 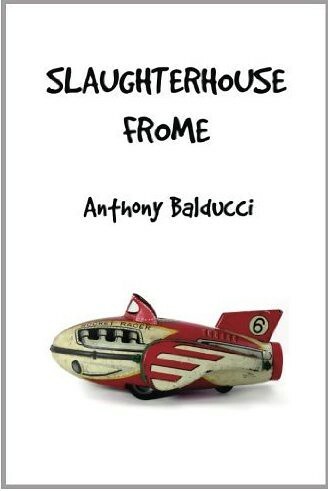 I am not the only film book author who prefers to use an illustration instead of a photo. 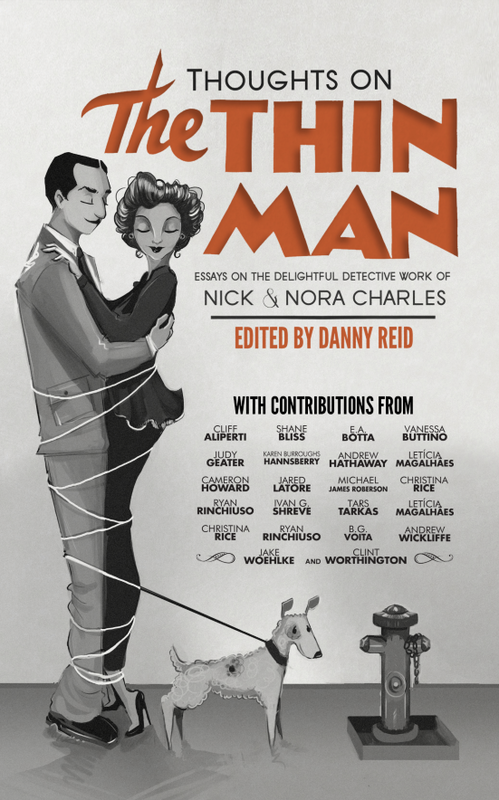 Take, for instance, the writers who recently put together this book about the Thin Man film series. They could have easily used the photo on which the illustration was based. Or they could have used this welcoming portrait. But they chose an original illustration. I have to say that it got my attention and I did, as it turned out, purchase the book. 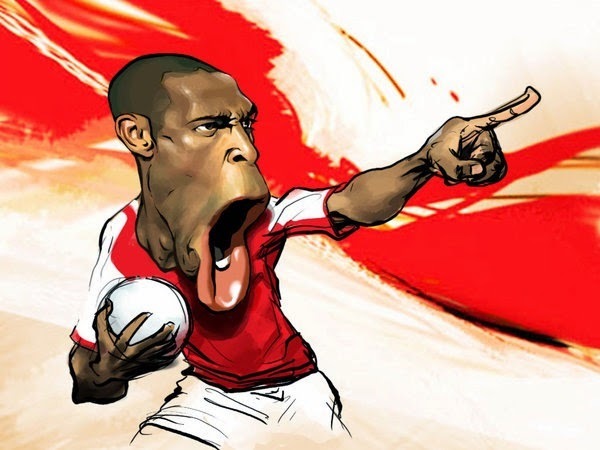 It fascinates me that the art of caricature can be accomplished in so many different ways. 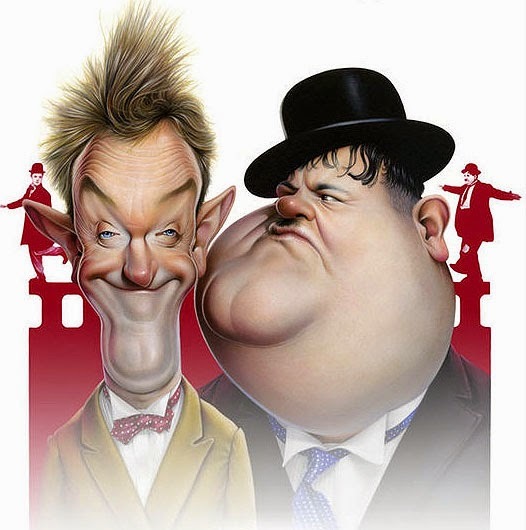 Let us examine the many ways that illustrators have drawn Laurel and Hardy. I would like to take this opportunity to acknowledge other caricaturists that I admire. 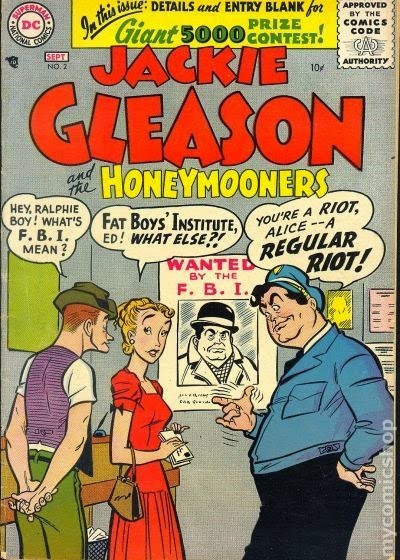 Now, let me talk about caricatures that I don't like. This level of distortion and exaggeration is unappealing to me. 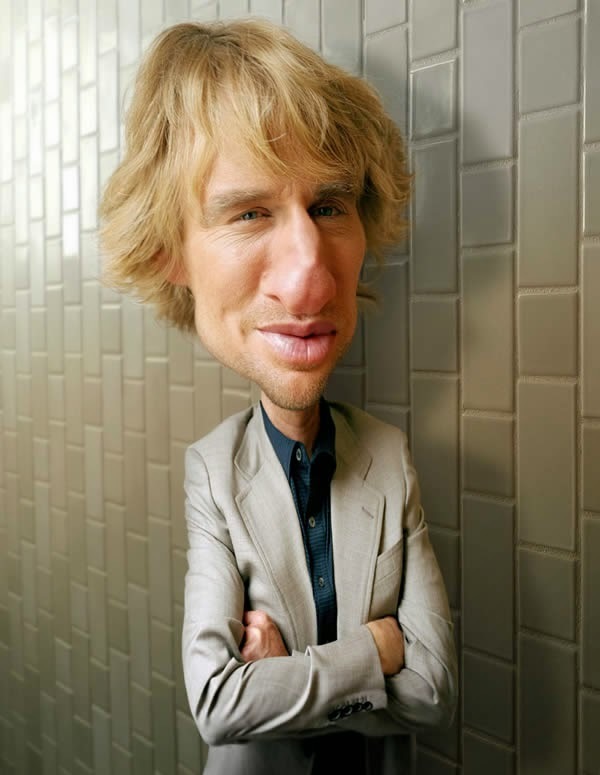 Today, this type of caricature has become commonplace due to Photoshop, which allows users to grossly manipulate photos of actors. 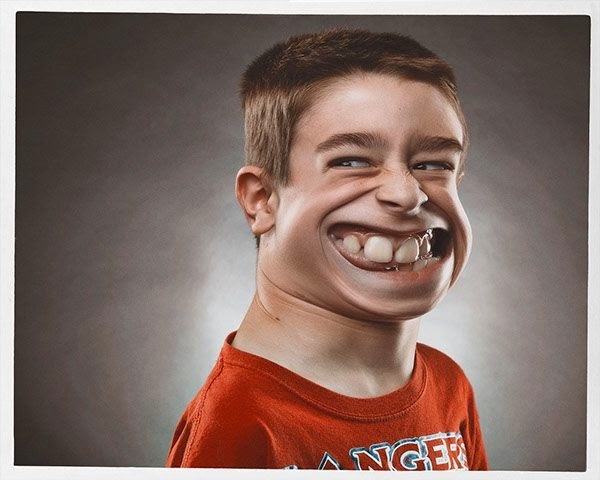 Using Photoshop to enlarge an actor's ears, inflate their nose or stretch out their chin may make the image surreal and silly, but it does nothing to convey the personality of the subject. That takes the very specialized skill of a free-hand caricaturist. 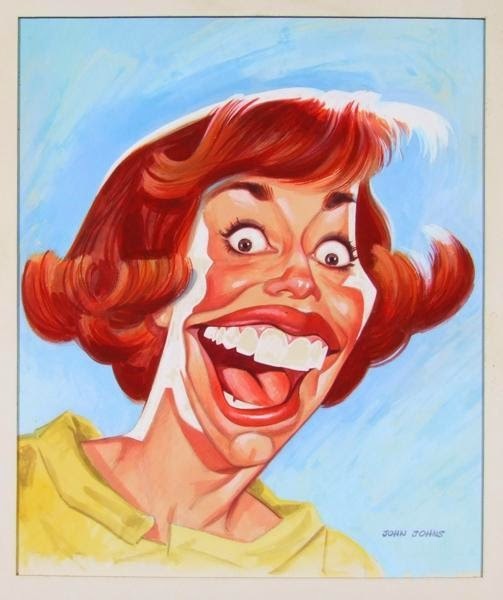 Compare a portrait of Carol Burnett created by John Johns to a similar portrait created by a Photoshop artist. 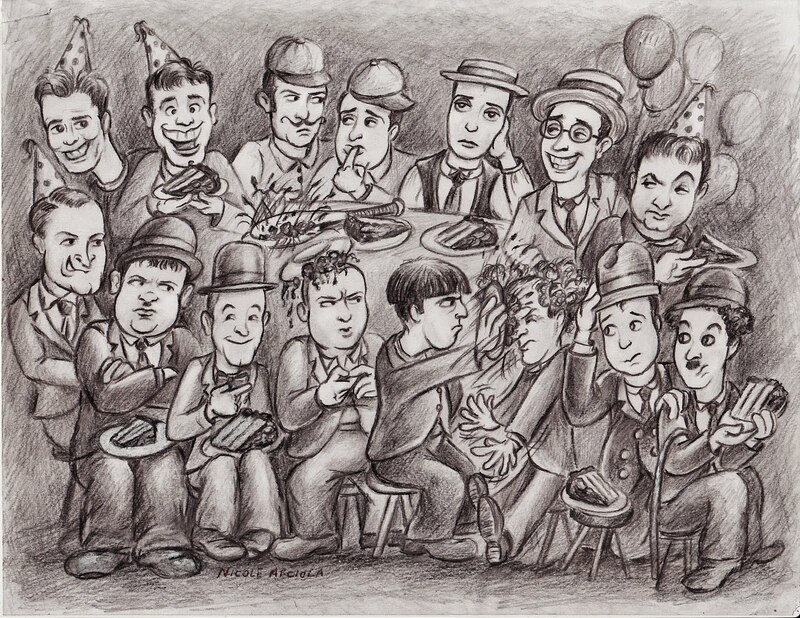 I could never get the idea of a group caricature out of my head. 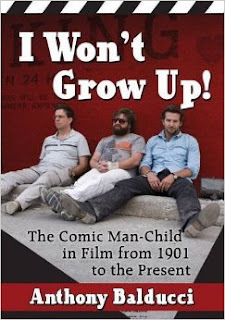 I got the idea to promote my upcoming book, I Won't Grow Up!, with illustrations of famous comedians dressed as children. I hired an illustrator to create three separate character illustrations and a fourth illustration that combined the characters into a single image. 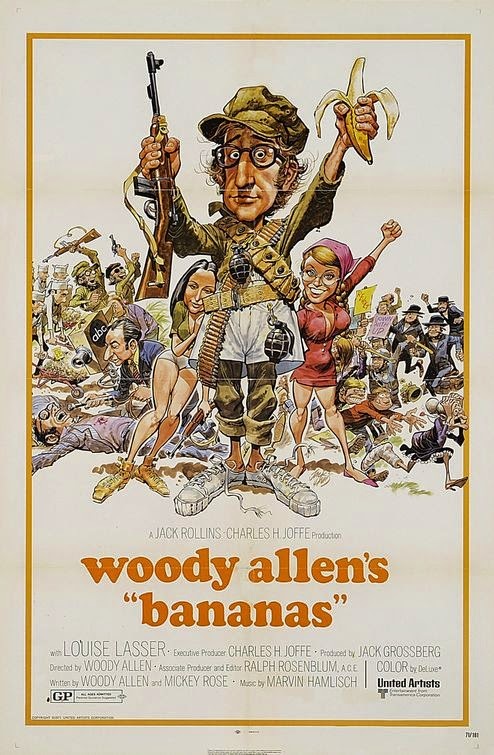 The finished montage features a rattle-shaking Seth Rogen strapped into a high chair, a mischievous Jerry Lewis yanking on a cat's tail, and a genial Lou Costello riding through the frame on a tricycle. But this trio looks thin compared to the teeming group portraits of the past. I can't stop imagining a slew of comedians dressed in kiddie attire tearing apart a day care center. 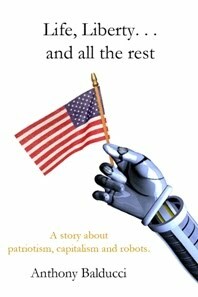 I hope that, when my budget allows, I can work with an illustrator to make this image happen. I wanted to share a few images and film clips that I came across recently. 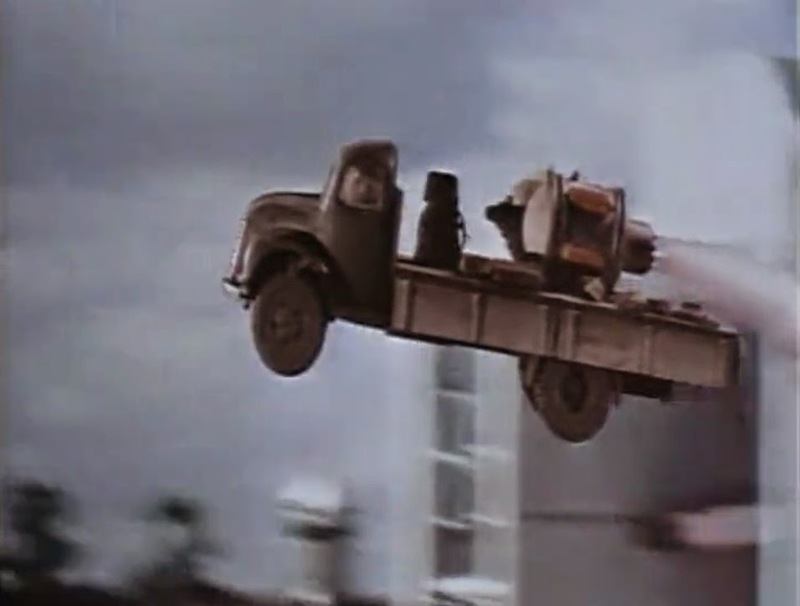 Many of the film clips came from a YouTube channel created by film collector Tommie Hicks, Jr. 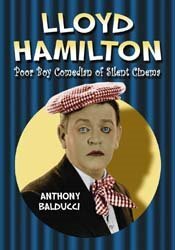 Here is Harry Langdon featured in promotional stills for Flickering Youth (1924). 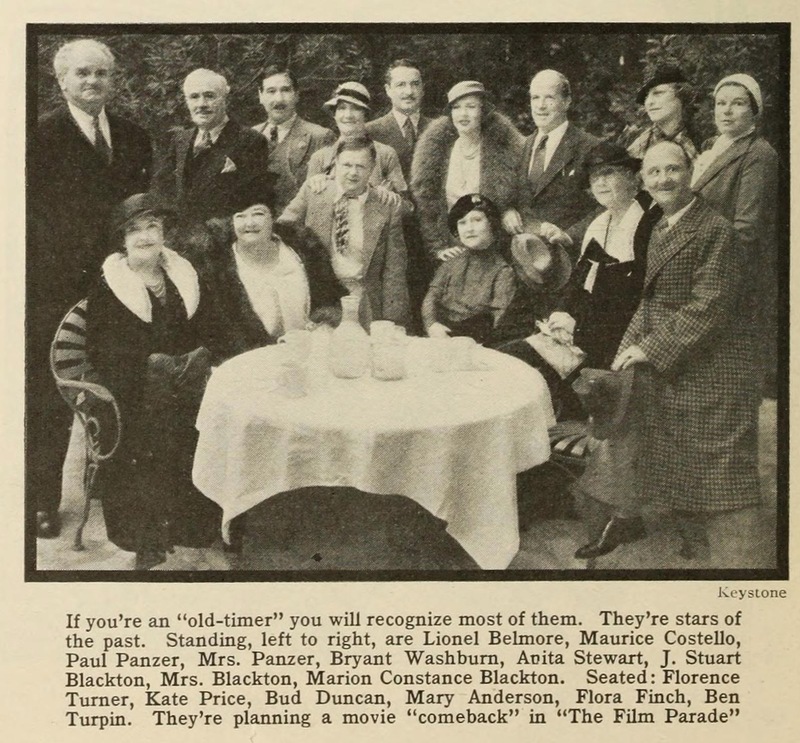 In 1933, old-time film stars gathered to promote a documentary called March of the Movies (formerly titled The Film Parade). 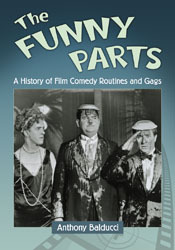 The comedy stars included in this group are Kate Price, Bud Duncan, Flora Finch and Ben Turpin. 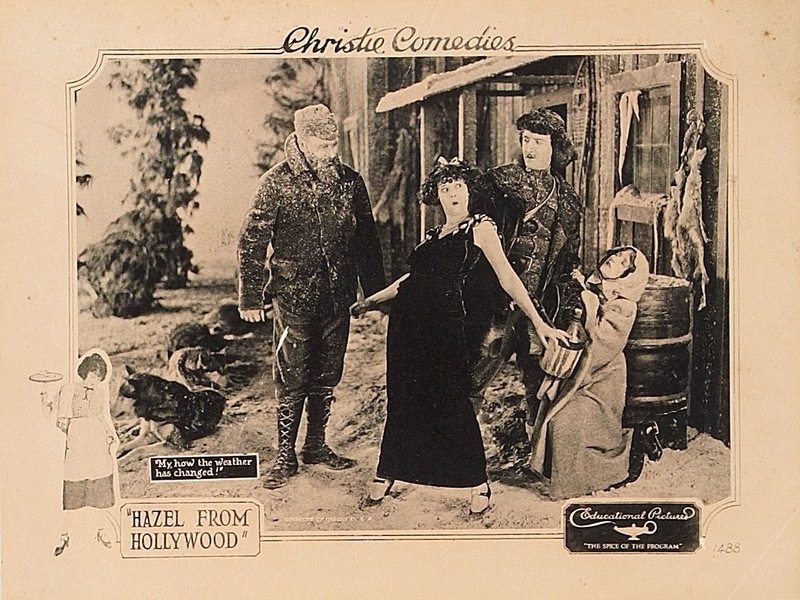 Here is a lobby card for Hazel from Hollywood (1923), which was one of Dorothy Devore's most popular short comedies. 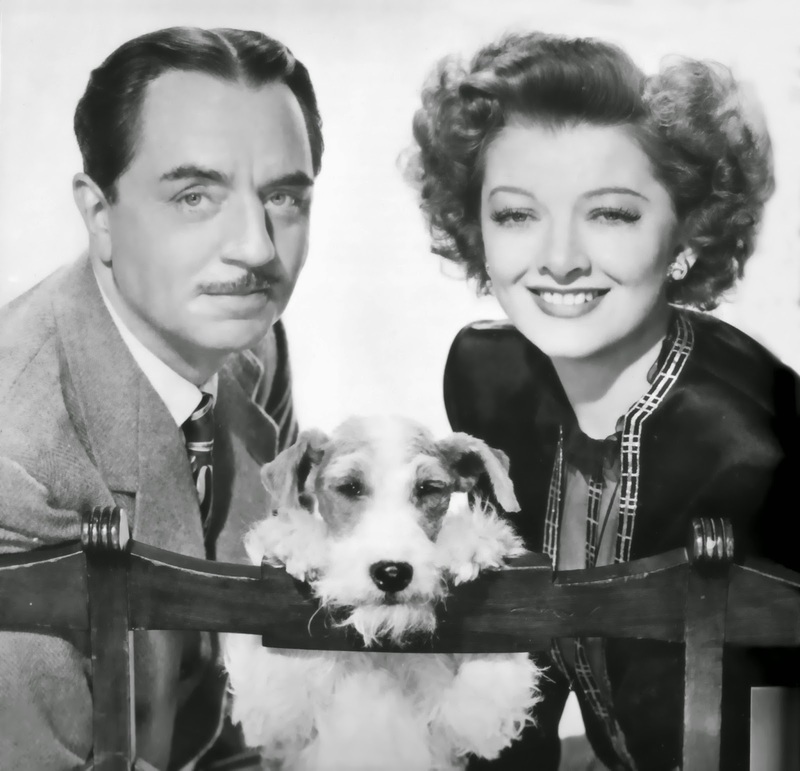 When I wrote about Devore in Eighteen Comedians of Silent Film, it was my understanding that Hazel from Hollywood was a lost film. 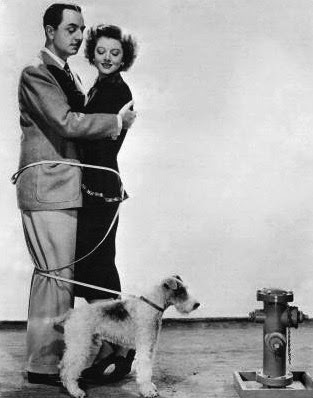 However, film critic Hal Erickson recently reported on Facebook that he got to see a print of Hazel at a film archive. 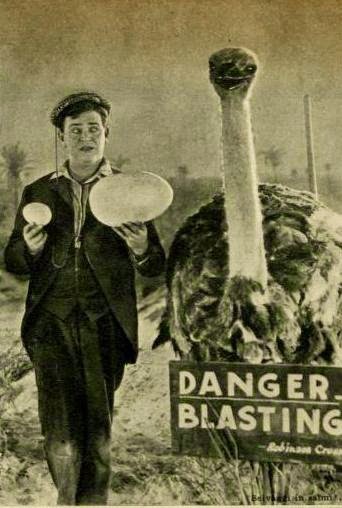 Lloyd Hamilton uses explosive ostrich eggs to battle savage tropical natives in his most highly acclaimed short comedy, Robinson Crusoe Ltd. (1921). 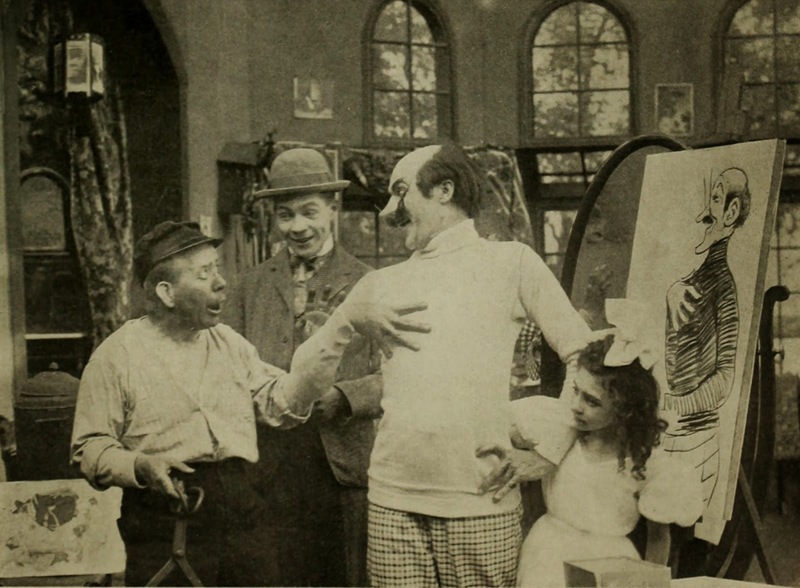 Lloyd Hamilton and Bud Duncan are up to their usual hijinks in Ham and the Jitney Bus (1915). Sid Smith flees a firing squad in an unnamed comedy. The scene was filmed on Universal's Hunchback of Notre Dame set. 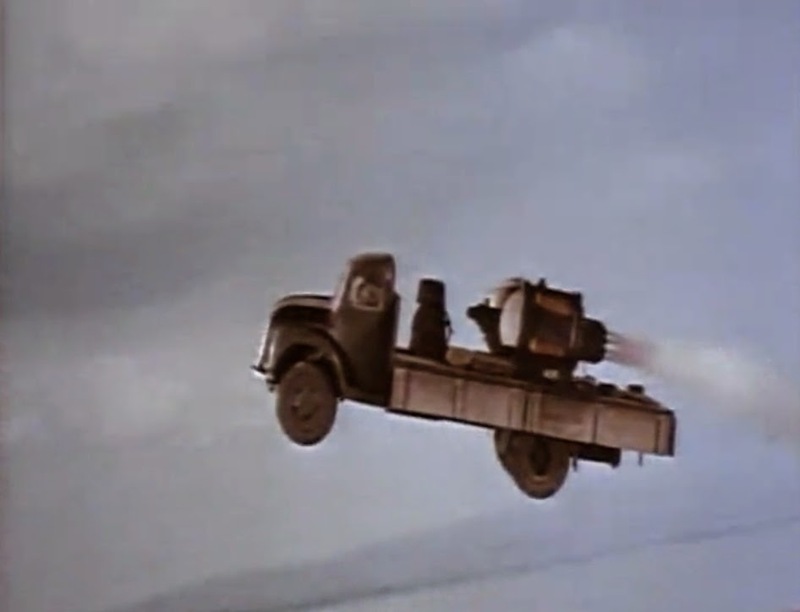 I overlooked a couple of flying car comedies in an earlier post. 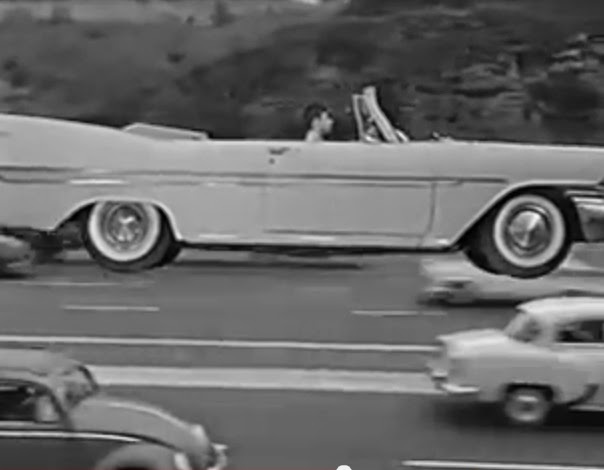 Jerry Lewis, as an alien from outer space, avoids rush hour traffic by causing his car to levitate in A Visit to a Small Planet (1960). 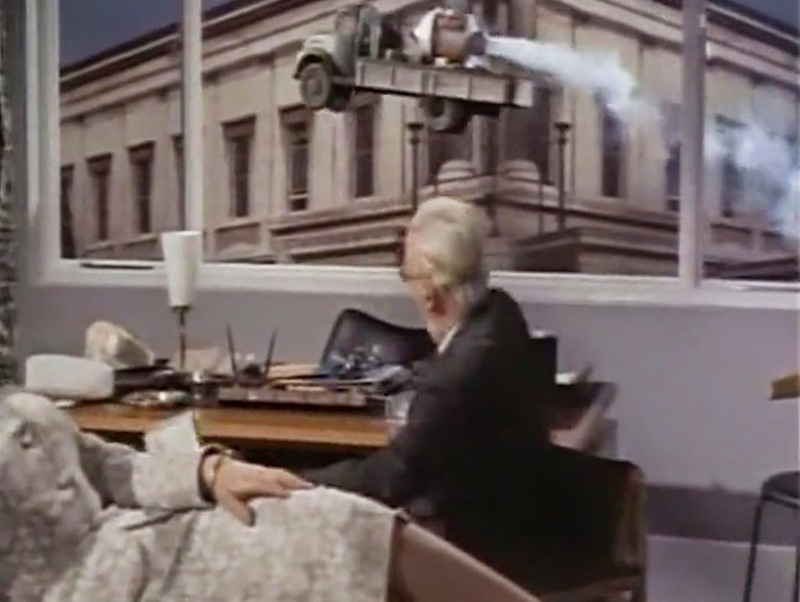 Bob Hope is trapped inside a rocket-powered flying truck in the spy spoof Call Me Bwana (1963). 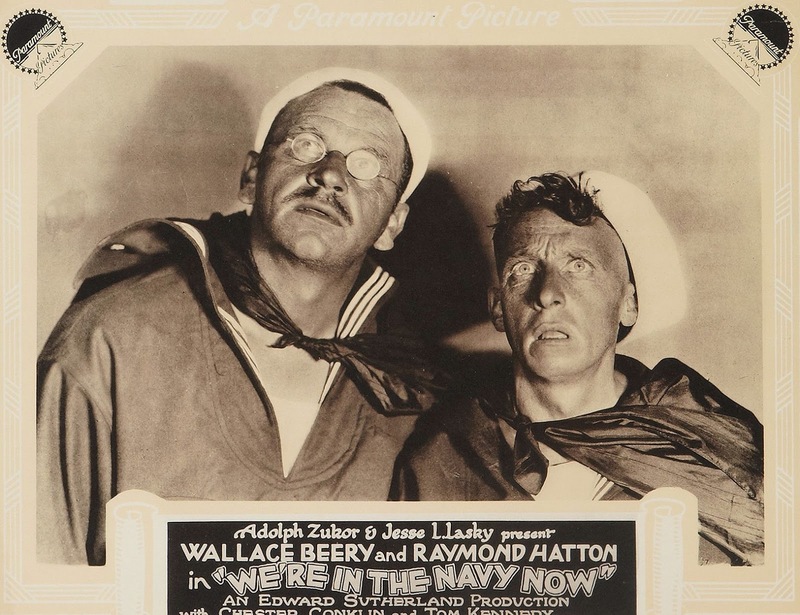 I have always said that the Final Destination films owe a debt to silent film comedy. This scene from "Big Boy" comedy Kid Tricks (1927) could easily be reworked into a Final Destination death scene. Director Charles Lamont kept the action moving quickly in Kid Tricks. 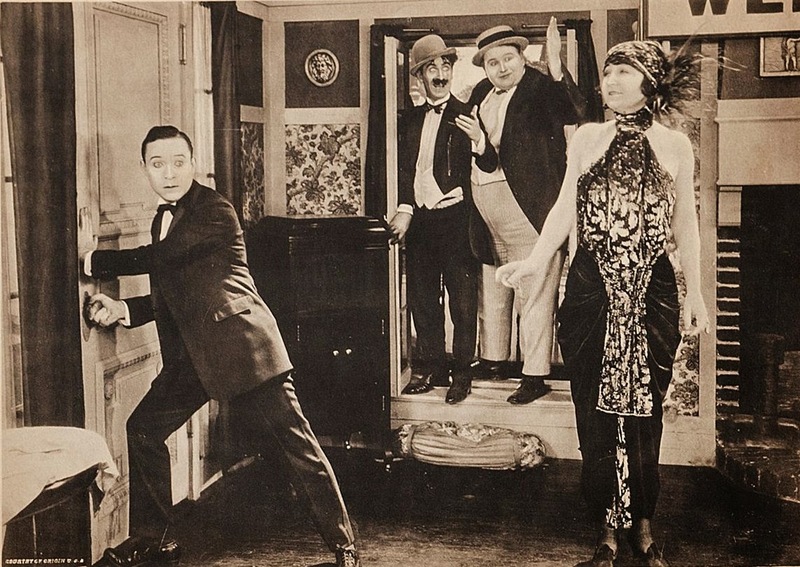 Hank Mann derives a uniquely absurd routine from an exceptionally long dress train in Hot Dogs (1920). 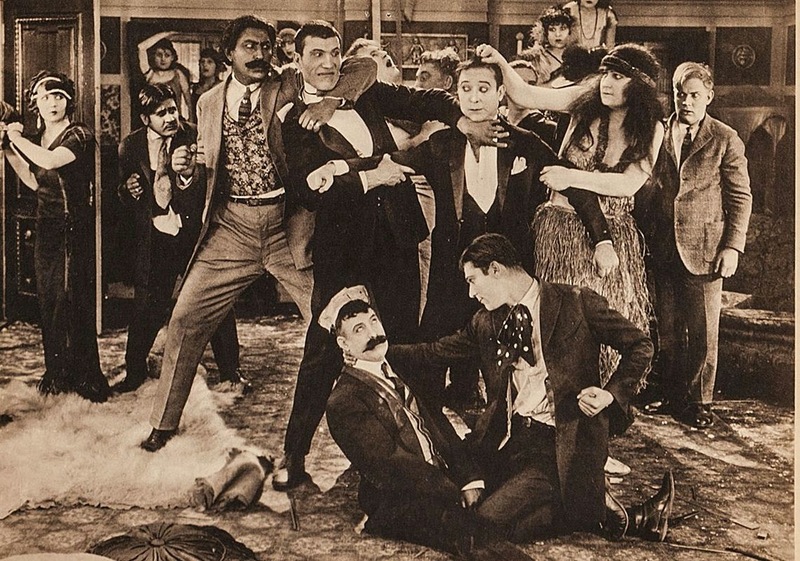 Let us take a look at two early comedy teams in film history. 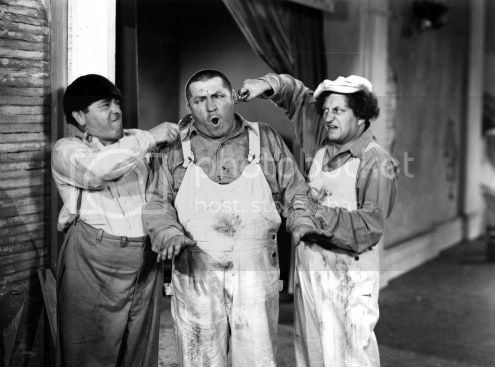 The first is Oscar and Conrad, comic Dutch characters played by Claude Cooper and Frank E. McNish. In this clip from Guiders (1916), Oscar and Conrad are attacked by a variety of animals as they work as tour guides in Florida. This is Lyons and Moran struggling with a dilapidated jalopy in Give Her Gas (1918). 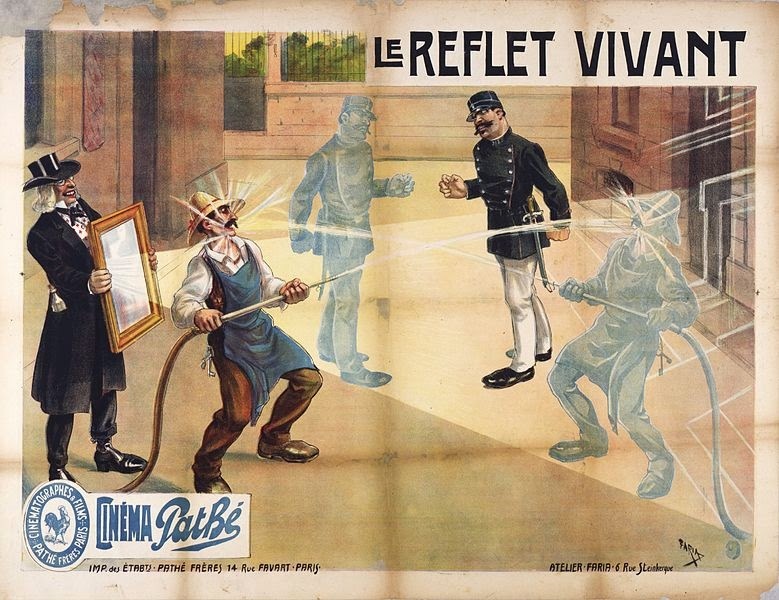 A popular vaudeville novelty act was Dronza, a mechanical talking head that answered questions from audience members. The audiences were amazed because they could detect no signs of ventriloquism. It seemed as if Dronza was actually talking on his own. 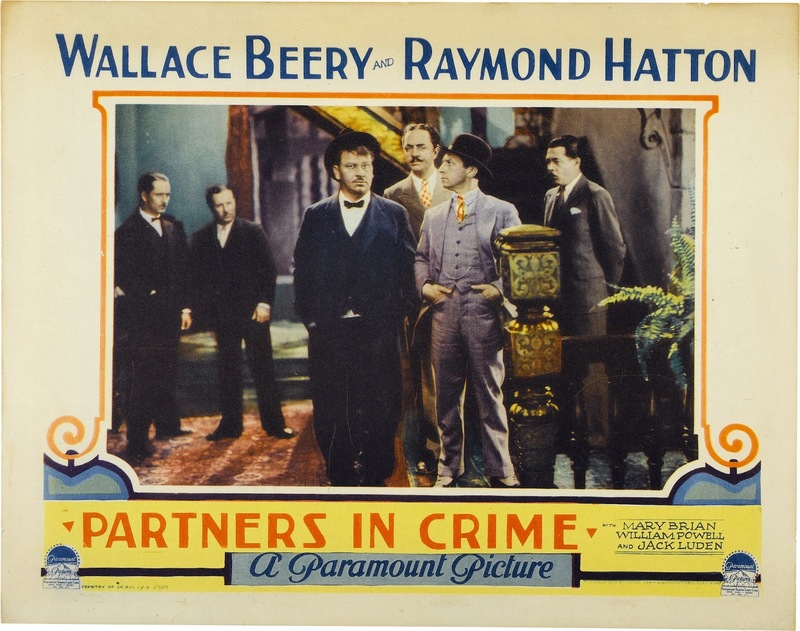 I found these lobby cards for Beery and Hatton features on an auction site. 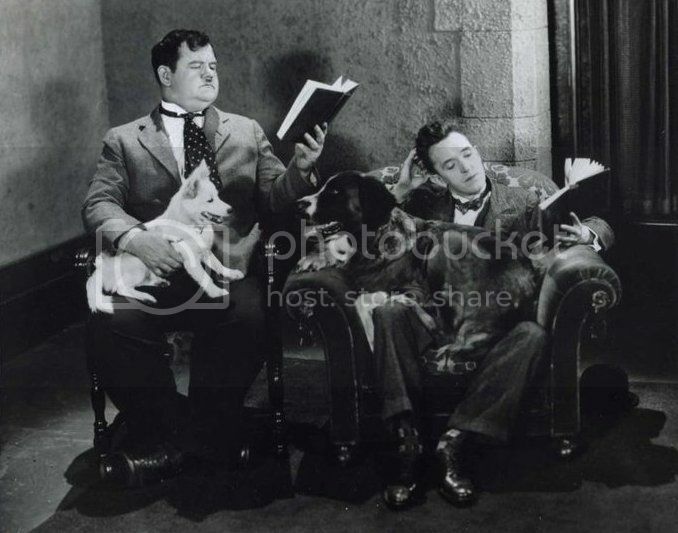 This is a photo from a 1912 Edison comedy, Uncle Mun and the Minister. 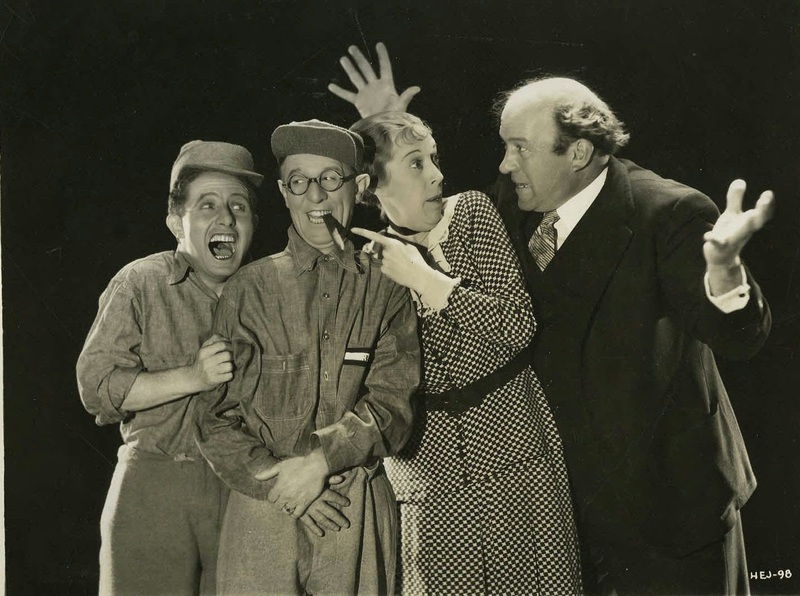 I believe that the actors are, from left to right, Edwin O'Connor, Arthur Housman, Fred I. Nankivel and Shirley Mason. 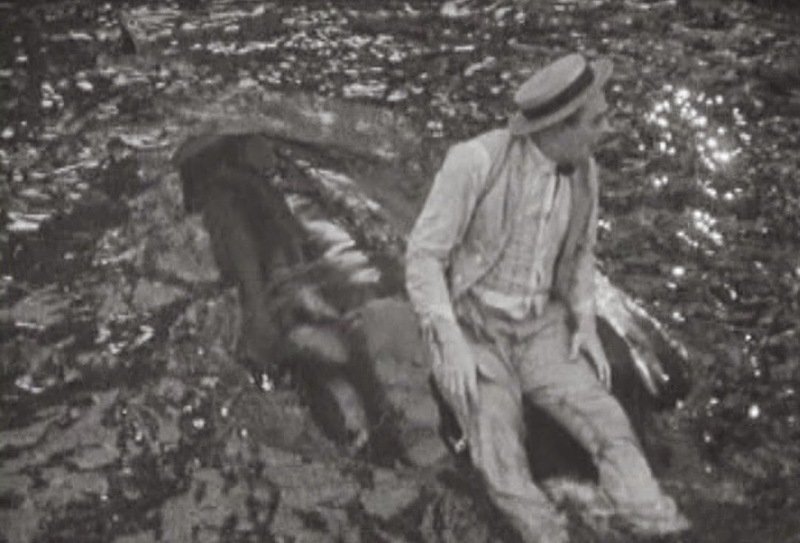 This screen capture from the1923 Sennett comedy Skylarking features Harry Gribbon riding a whale out to sea. 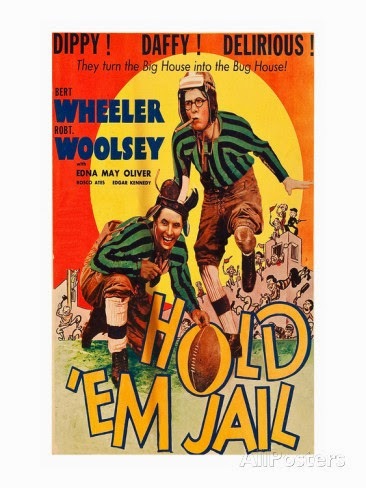 Bert Wheeler and Robert Woolsey are enjoying a joke at the expense of Edna May Oliver and Edgar Kennedy in the prison comedy Hold 'Em Jail (1923). In 2001, I went through an acrimonious divorce. I was so devastated by the experience that I couldn't be bothered to maintain proper grooming habits or keep to a healthy diet. 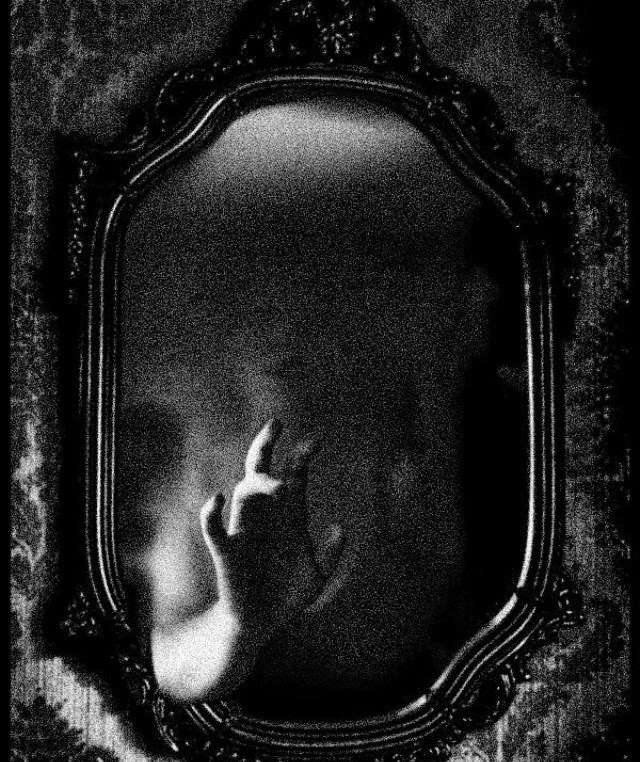 I became so unkempt and out of shape that I frightened people wherever I went. When I went to see The Lord of the Rings, kids threw popcorn at me because they thought I was a Balrog. 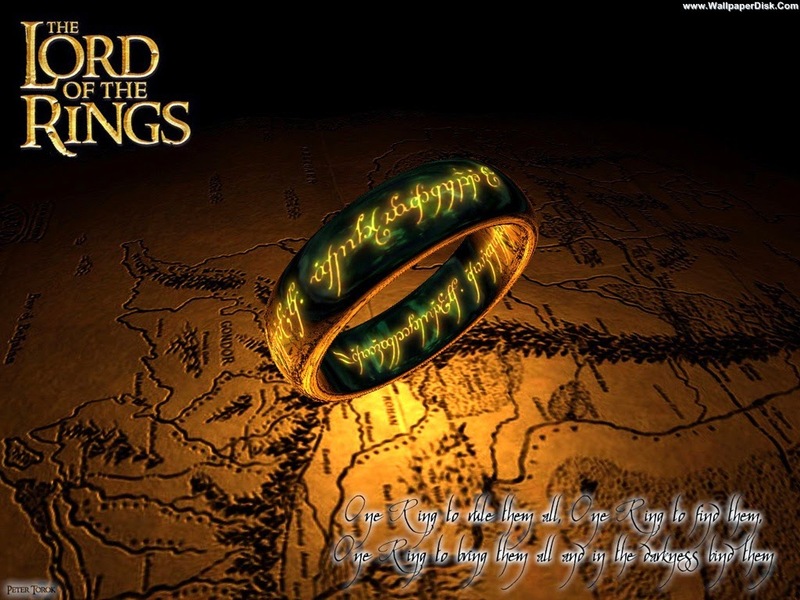 But I found myself heartened by The Lord of the Rings, which was able to move me on a deeply personal level. Let us briefly examine the story. Central to the story is an evil ring. It is just a plain band of gold but it terrifies the hell out of everyone. People see the ring and they sweat buckets. Of course they do, is it lost on anyone that the ring looks like a wedding band? 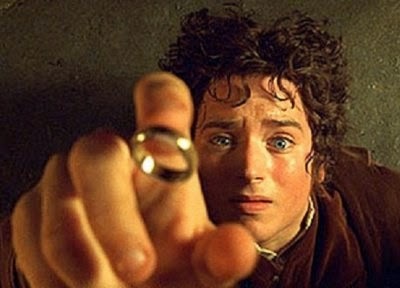 This poor guy, Frodo Baggins (Elijah Woods), has been burdened with the ring and he's desperate to get rid of it. After sharing a few hits on a bong, a group of manly buddies risk their lives to help Frodo take the ring to a fiery pit so he can pitch it in. This is the only way to destroy its evil powers and be freed. At the time, I imagined that the man who wrote the script must have gone through a divorce as bad as my own. I realized that I misread the Ring trilogy by the time that I saw the last film, The Lord of the Rings: The Return of the King (2003). The trilogy was not at all about the vows and symbols that bind a man and a woman. The films managed, by adopting decidedly feminist perspective, to wholly reject the notion of men and women engaging in committed relationships. Marriage, what's that good for? I should at least be able to escape the harangue of feminists when I sit down to watch a fantasy adventure movie about knights, wizards, elves and dragons. But, no, that’s not how it worked in this case. Screenwriters Philippa Boyens and Fran Walsh worked tirelessly to interject feminist propaganda into Tolkien’s Middle-earth trilogy. They were on a sacred mission. One feminist blogger felt such devotion to Boyens‘ efforts that she dubbed the screenwriter "St. Philippa of the Screenplay." Boyens made herself hero to feminists early on. 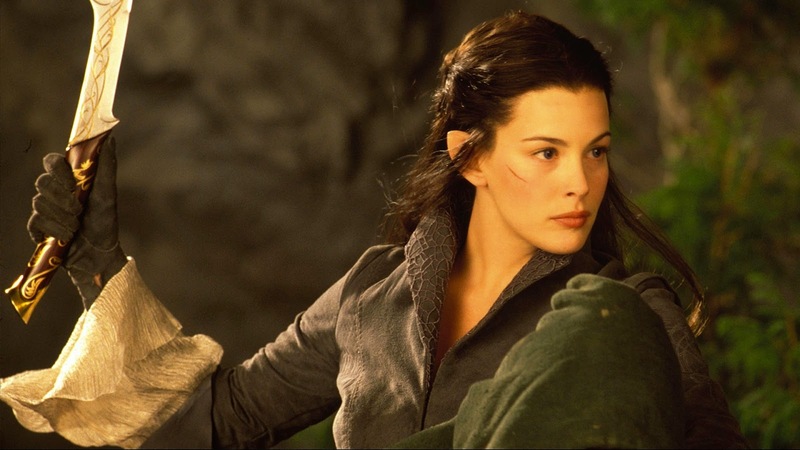 While writing the first movie, she decided that Tolkien had made elf princess Arwen too passive and she simply had to do something about that. So, she took a heroic rescue scene performed in the book by a male swordsman and reworked the scene for Arwen, thereby transforming the enchanting royal lady into a sweaty, muscular Xena Warrior Princess. Fans protested when they heard about this, which prompted director Peter Jackson to abandon the scene. However, this did not deter Boyens and Walsh, who would continue to pursue their feminist agenda in less obvious ways. Dominant in the feminist dogma is the belief that women are cheapened and fooled by romantic devotion to men. This presented a problem for Boyen and Walsh as the story’s two leading ladies, Arwen and Eowyn, are willing to risk their lives for the love of a nobleman, Aragorn. In the book, Eowyn confronts Aragorn as he prepares to ride toward the Paths of the Dead. She fears for his death and wants to join him on his dangerous journey. Eowyn falls into despair when Aragon rebuffs her. Boyens sought to lessen Eowyn’s heartbreak and indicate factors other than Aragorn’s rejection as the reason for her tearful mood. Boyens said that it weakened this woman to be “suicidal that some guy had ridden off and left her.” Walsh added, “We didn’t want to victimize her in that scene.” Let the feminist message go out to the world: To give your heart to a man and to shed a tear over his potential death is to be a victim. An important moment in the book occurs when Arwen decides not to flee to the safety of Rivendell and remain in Middle-earth in hope of Aragorn’s return from war. She refuses to believe the two of them will never be together again and she is willing to wait for him even if it means sacrificing her immortality. Boyens and Walsh changed this significantly in the movie. They had Arwen leave for Riverdell and, en route, have a vision of a child she will bear if she marries Aragorn. She decides to turn back and remain in Middle-earth not for Aragorn but for the child. Boyens said that, without this vision, she could not see “why the hell” Arwen would have reason to stay. A woman can never be motivated to make a great sacrifice for a man, even though it’s acceptable for a man like Aragon to repeatedly risk his life to protect his loved ones. Devotion and sacrifice are serious burdens and serious burdens are to be born only by men, who are too thick-skulled to know better and too useless to otherwise matter. And this came from two women who admitted that, in reading the Tolkien books, the female character they related to the most was Shelob the giant spider. Films can be highly influential. It is dangerous and immoral to sneak insidious propaganda into a seemingly innocent film. Even when its message is out in the open, protest drama is invariably limited in its artistic value and its understanding of human character. Protest drama is at most times boring and at other times irritating.